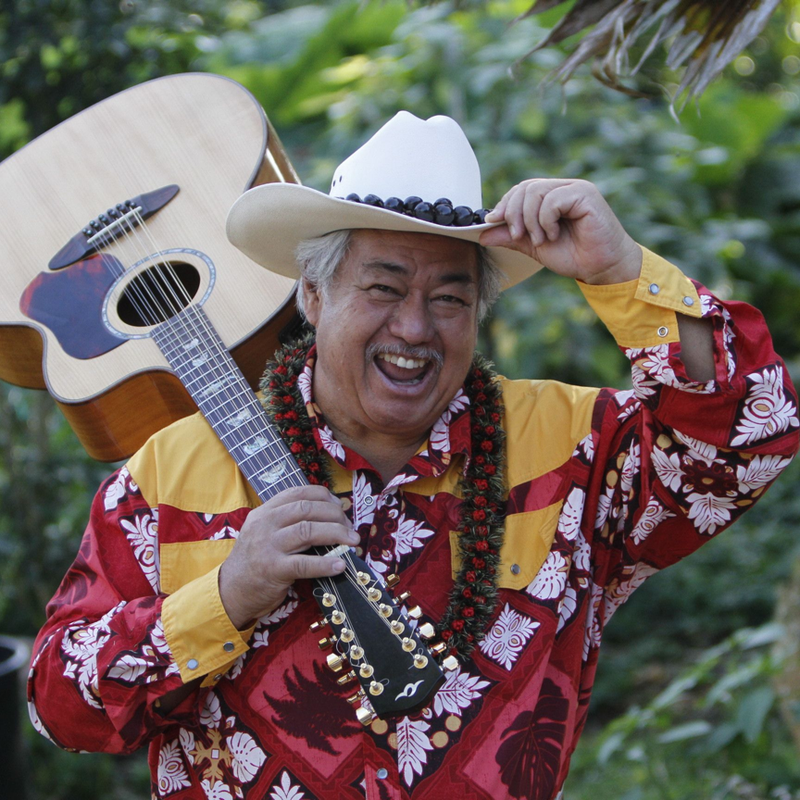 Four-time Grammy-winner George Kahumoku Jr. is a master of Hawaiian slack key guitar. Known as “Hawai‘i’s Renaissance Man” – he’s also a vocalist, raconteur, songwriter, world-touring performer, teacher and farmer (traditional Hawaiian sustainable agriculture) — he is a multiple Na Hōkū (Hawaii’s “Grammy”) Award winner. With over 25 solo, collaboration, and compilation CDs to his name, George celebrates over 13 years of his famed weekly Slack Key Show on Maui, which produced the 4 Grammy-winning CDs. He founded the Hawaiian Music Institute at University of Hawai‘i-Maui College to preserve the legacy of Hawaiian music and to prepare the next generation for careers in music. A renowned storyteller, George collaborated on the book A Hawaiian Life with long-time friend Paul Konwiser to capture his hilarious, entertaining on-stage stories; the sequel has just been published. This project led to his film biography Seeds of Aloha, and his producing the Masters of Hawaiian Music Film Series to document the stories of leading contemporary Hawaiian musicians. For the last 15 years, George Kahumoku Jr.’s Annual Maui Slack Key Guitar and ‘Ukulele Workshop creates one of the great musical learning experiences in the Islands today, and embodies George’s belief in sharing, celebrating, and perpetuating the unique music and culture that is Hawai‘i. All session by George Kahumoku Jr.